Heat oil in the frying pan.. Finely dice chicken and add to pan. Finely dice stuffing and add to pan. Finely dice yorkshire puddings (if available) and add to pan. Finely dice potatoes and parsnips and add to pan. Mix together and fry for a few minutes. Finely chop remaining vegetables, mash together, and add to pan. Add black pepper to taste and mix well. Pre-heat the grill to a high setting. Using a wooden spoon, mash ingredients in the pan until it starts to steam from the edge. Remove pan from heat and place under the grill as high as it will go. Grill until the top has browned. 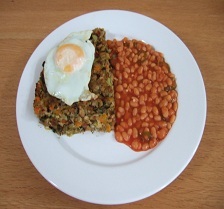 Serve with a fried egg and baked beans. You can use any leftover meat for this dish. 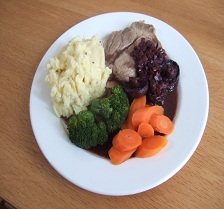 You can use mash instead of roast potatoes although we prefer the dish with roasties. The vegetables and other ingredients are just a suggestion, any leftovers from the roast will do. A balance of meat, potatoes and other vegetables works best. Peel and chop onions finely and fry in olive oil in the 4-5 Litre / 1 Gallon saucepan with the lid on until soft. Peel and halve potatoes and cook till just turning soft (saving 2 cups of the potato water) and drain and allow to cool a bit. Add finely chopped garlic and rosemary to the onions and sauté for a few minutes. Cut chicken to 2.5cm / 1" squares, add to pan and fry until whitened. Slice and dice the chorizo into very small cubes and add to the pan. Crumble the stock cubes into a 1 litre / 2¼ pints of hot water and stir well. Add stock, potato water, tinned chopped tomatoes, pearl barley, herbs. tomato puree and paprika and stir well. Peel and slice carrots and add to the pan. Peel and halve the turnips and cut into half moons and add to the pan. Peel and slice the leeks to 1cm / ½" thick, wash thoroughly and add to the pan with the potatoes. Add the red wine and stir thoroughly. Bring to the boil, then reduce heat and simmer with lid on for 60 minutes. Peel and halve mushrooms and add to stew. Serve with seasonal vegetables and crusty bread. Place the chicken breasts in the medium saucepan and cover with hot water. Simmer until the chicken is cooked. Remove the chicken from the water and allow to cool. Slice and cook the onion in the olive oil in the frying pan/wok until soft. Wash, trim and chop the spring onions. 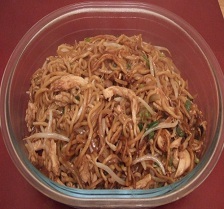 Add the garlic, ginger, spring onions, five spice powder and soy sauce to the onions and stir. Shred the chicken and and to the wok. Add the egg noodles and stir well. Heat through mixing all the ingredients together thoroughly. Add the bean sprouts and black pepper to taste. After a few minutes add the sesame oil and mix in. Finely chop the garlic and cut the chicken into strips about 1cm/½" thick. Add garlic to the onions and fry for a few minutes and then add the chicken. When the chicken has whitened add the stock cube and mustard. Pour in the white wine and the hot water, stirring all the time. Slice the mushrooms fairly finely. Add the mushrooms and the cream. Increase the heat and while stirring all the time, reduce the sauce until it has thickened. Crush the garlic and finely chop the thyme and mix with the butter and a little black pepper. To butterfly the chicken, lay the breast on the chopping board, place one hand flat on the breast. Using a sharp knife cut horizontally, but not all the way through the breast. Now open out the breast to make a butterfly shape. Place a quarter of the butter mixture on a breast and roll to encase the filling. Mix a little black pepper with the flour. Roll each breast in the flour to coat well. Roll each floured breast in the egg, saving the remaining egg for later. Now roll the breasts in the breadcrumbs, saving the remaining crumbs for later. 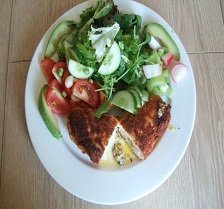 Remove chicken breasts from the fridge and roll in egg, then breadcrumbs once more. When the oil is very hot, carefully place each breast into the oil using the fish slice and fry for 10-15 minutes turning once. Place in pre-heated oven for 15 mins to finish cooking. Serve with baked potatoes, salad or seasonal vegetables. Chop peppers and add to saucepan. Chop chicken into cubes and add to pan. Cook until chicken has whitened then add the stock cubes and paprika. Stir well to coat the ingredients. 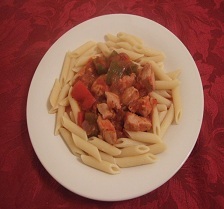 Pour in the tinned tomatoes, herbs, some pepper, and the tomato puree and stir well. Allow to simmer for 40 minutes. Peel and quarter the mushrooms and add to pan. Cook the pasta in 2 Tbsp of the olive oil till pasta is cooked but firm, drain and put aside. Chop onions finely and fry gently in the remaining olive oil until softened. 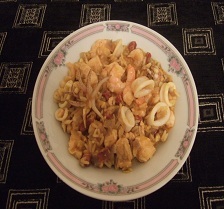 Cut chicken and chorizo (if using) into 1cm / ½" cubes and add to pan. Cook until chicken has whitened. Cut aubergine (eggplant) into 1cm / ½" cubes and add to pan. Add the rest of the ingredients, apart from the cheese and season well with black pepper. Transfer ingredients into the large glass roasting dish. Grate the cheese and sprinkle over the top. Bake in the middle of the over for 30 minutes. Add finely chopped garlic, sauté for a few minutes. Add stock cubes, pepper, and herbs and stir to coat all ingredients. Add the water, stir well, and then simmer for 20 minutes. 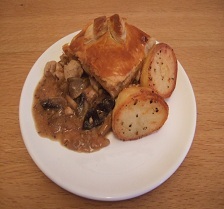 Peel and quarter mushrooms and stir into chicken mixture. Mix gravy browning with a little cold water and pour slowly into pan, stirring constantly. When mixture is nice and thick, remove from heat and pour into glass roasting dish. 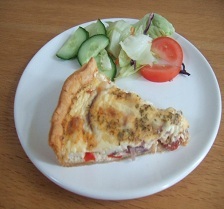 Roll out pastry to about ½cm / ¼" thickness, ensuring it will cover the dish. Spread the knob of butter around the top edge of the glass dish to help the pastry stick. Lay pastry over dish and push into corners. Press all around the edge to seal. Cut off excess pastry and use this to make decorations for the pie if you wish. Cut a little air vent in centre of pie. 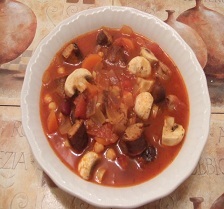 Serve with season vegetables or chips and beans. Pastry in recipes is given as a weight which applies to the amount of flour used not the total weight of pastry. As a rough guide 225g/8oz will cover a 30cm/20cm (12”/8”) large glass roasting dish. If you need more or less pastry, simply adjust the ingredients accordingly. If you are making the pastry in advance, wrap in cling film and refrigerate until required. Add stock, potato water, tinned chopped tomatoes, pearl barley, herbs, tomato puree and paprika and stir well. Peel and halve the parsnip and turnips and cut into half moons and add to the pan. To make the dumplings mix the flour and suet with a few tablespoons of water to make a firm, pliable dough. Divide into 12 and roll softly into balls with floured hands. Add the dumplings to stew and cover with lid (turning heat up slightly). The dumplings take about 20-25 minutes. Serve in bowls with crusty bread. Peel and chop onions finely and fry in olive oil in the large saucepan with the lid on until soft. Add finely chopped garlic to the onions and sauté for a few minutes. Finely chop the basil and add to the pan along with the chopped tomatoes and white wine. Crumble in the stock cubes and add pepper to taste. Simmer without lid on for 40 minutes to reduce. Peel and halve mushrooms and add to the pan. Finely chop the rosemary and add to mixture. Slice chorizo and then cut into into small cubes and add to pan. Finely slice chillies and add to saucepan. Saute for a few minutes then add the chicken. Add stock cubes, chilli powder, cumin, paprika, worcestershire sauce, dark soy sauce and mustard powder. Add black pepper to taste and stir well to coat the meat. Pour in tinned tomatoes and the remaining herbs, some pepper, and the tomato puree. 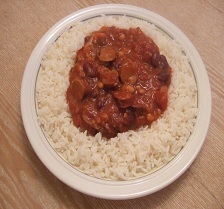 Rinse kidney beans in cold water and add to pan. Stir well. Allow to simmer for 40-60 minutes. Simmer for a further 10-15 minutes. 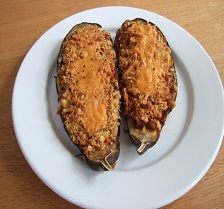 Serve with rice or jacket potatoes and grated fresh parmesan or cheddar cheese. Fry chicken, skin side down, in 2 Tbsp olive oil in the frying pan. You will have to do this in a couple of batches. When the skin has browned, turn the chicken over to brown the other side. When each batch is browned both sides, remove it to a plate using the slotted spoon. Slice the cooking onions finely and peel the shallots. Add 1 Tbsp olive oil to the saucepan and fry the lardons. When the lardons have browned, remove excess fat and add the onions and shallots. Finely chop the garlic and add to the onions and lardons. Lay the chicken on top of ingredients in saucepan. Sprinkle herbs over chicken and season with pepper. Pour wine around the chicken a little over the top. Put the lid on and simmer gently for 1 hour. Wash mushrooms, trim stalks and add to saucepan. Cook for a further 15 minutes. Mix the flour and butter to a paste. Remove chicken to a plate using a slotted spoon. Add the butter paste to the saucepan, stirring quickly until the sauce has thickened. Return chicken to the pan to warm through. 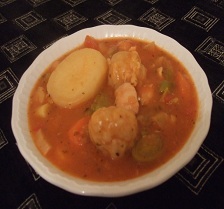 Serve with boiled potatoes and vegetables. Fry in olive oil until soft. Peel and finely chop the garlic, add to the onions. Finely dice the chorizo and add to the saucepan. 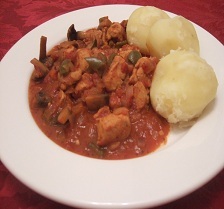 Cut the chicken into small cubes and add to saucepan. Add the rice, stir ingredients until the rice turns opaque. Add the ginger, turmeric and paprika and stir well to coat all the ingredients. Dissolve the stock cubes in the hot water and add to the saucepan. Stir well, cover, and simmer for 20-30 minutes until all the water has been absorbed. Cut baby squid into rings and add to saucepan. When the squid is cooked, add the prawns. As soon as the prawns are hot, serve in bowls. 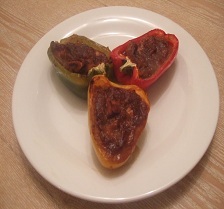 If using peppers, decore, deseed, cut into 2.5cm / 1" cubes and add to pan. If using chorizo cut into small 1cm / ½" cubes and add to pan. Cook until whitened then add the stock cubes, black pepper to taste and stir well to coat the meat. 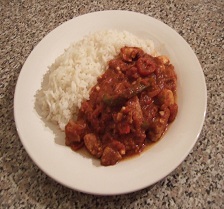 Pour in tinned tomatoes, wine, the remaining herbs, the tomato puree and stir well. Allow to simmer for 30-45 minutes. Peel and halve the mushrooms and add to the saucepan. 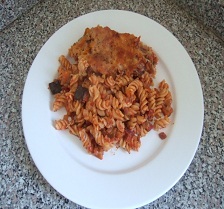 Serve with pasta of your choice and grated fresh parmesan or cheddar cheese. When you cook the pasta add 2 Tbsp of olive oil to the water, to prevent the pasta sticking. When cooked drain the pasta in a colander, but don't pour boiling water over it. 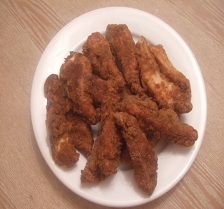 Cut Chicken into strips 2cm/1” wide. Beat egg in a bowl, add milk and hot sauce and stir together thoroughly. Add the chicken and leave to soak for 15-20 minutes. Preheat oven to 180ºC / 350ºF / Gas Mark 4. Place all the remaining ingredients in a separate bowl and mix together well. Drain chicken and coat each piece thoroughly with the spice mixture. Fry in the hot oil for 8-10 minutes. You will need to do this in a few batches. Drain each batch on kitchen paper. When all the chicken has been fried, place in the oven for 10 minutes. Serve with chips or salad. Mix flour, paprika, cumin and pepper together in one of the bowls. Beat eggs in another of the bowls. Coat each strip of chicken well with the flour mixture and set aside. Using the food processor, blitz the bread (including the crusts) to breadcrumbs. Pour the breadcrumbs into the remaining bowl. Recoat the chicken with the flour then dip into the egg, ensuring that it is totally covered. Then drop straight into the breadcrumbs and coat well. Place on the plate and repeat until all the chicken is coated. Cover with cling film and put in the fridge for 30 minutes. Fry the chicken in about 1cm/½" oil until lightly browned, turning once using the tongs or spatula. You may need to do this in two or three batches. When each batch is cooked (roughly 10 minutes per batch) place on kitchen paper and keep in a warm oven until you are ready to serve. Chop and deseed the chillies and add to the mixing bowl with the rest of the marinade ingredients. Dice the chicken breasts into ½" / 1 cm cubes, add to the marinade and stir in well. Cover and leave to marinade. Finely dice and cook the onions in the olive oil, on a medium heat with a lid on until soft. While the onions are cooking, half, deseed and trim the peppers using the paring knife and lay them in the roasting dish. Finely chop the garlic and add to the soft onions. Stir well and cook gently for a few minutes. Turn the heat up and add the marinated chicken and juices. Stir well and cook on a higher heat till the chicken turns white. Spoon the contents of the pan into the peppers. Place the dish in the centre of the oven and cook for 60 minutes. Serve with seasonal vegetables or rice. Finely chop garlic and fry gently in half of the olive oil. Finely dice the mushrooms and add to the pan with black pepper and herbs, fry gently. Using a sharp knife cut horizontally, but not all the way through the breast. Now open out the breast to make a butterfly shape. Saving the juice for later, spread mushroom and garlic mixture over one half of each of the breasts then fold them back over themselves, ensuring the filling is covered. Put a saucepan of water on the heat ready to poach the chicken. Lay two pieces of ham, slightly overlapping, on the board. Place one breast on top and fold the ham over it, don't worry if it doesn't quite cover the whole breast. 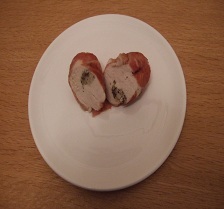 Cut a piece of cling film twice the length of the breast and lay the stuffed breast at one side, leaving an equal amount of film free at the top and bottom. Tightly roll the film around the breast. twist each end firmly and knot close to the filling. Place each rolled breast in the boiling water and poach for 20 minutes. Drain breasts in a colander. Cut off one knot and squeeze the other end to slide breasts out of cling film. Place in glass roasting dish. Drizzle over remaining olive oil and the juices saved from earlier. Roast on a high shelf for 20 minutes. Trim excess fat off the pork and cut into small cubes. Put the pork in the glass roasting dish. Peel mushrooms and cut into quarters, add to dish. De-seed and thinly slice peppers and chillies (optional) and add to dish. Now add all other ingredients except onions and rice. Mix well and leave to marinade while doing onions. Peel and thinly slice the onions and fry gently in the olive oil until soft. Once softened, add to glass dish. Place uncovered in centre of oven for 20 minutes. Remove from oven, stir well and return to oven for a further 20 minutes. While the pork is cooking, boil rice until tender. Once rice is cooked, transfer to a colander and pour boiling water over to remove starch. When we cook this dish we use a 2nd glass dish and put about 60% of the ingredients in it. 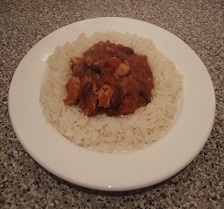 Then we put the chillies in that dish for a spicy dish and the children have the other dish. Lay chops on grill tray. Blitz breadcrumbs with fresh herbs and pepper to fine breadcrumbs. Mix breadcrumbs, garlic, oil, and mustard together. Place in centre of oven for 25-30 minutes. Finish off under the grill for 2-3 minutes until topping is nicely browned. Serve with potatoes and vegetables of your choice. Grill bacon until slightly crispy then chop roughly. Lay bacon in the base and sprinkle cheese on top. Pre-heat oven to 180°c / 350°f / Gas Mark 4. Fry pork in olive oil for no more than 7 minutes each side on a medium-high heat. Remove chops and put in an ovenproof dish. Put in oven to finish cooking. Peel and finely chop onion. Add onion to pan and fry until softened. Add the wine and stir to de-glaze pan. Cook until the wine has reduced by about two thirds. Crumble the stock cube into the hot water and stir to dissolve. Add the stock to the pan. Peel and trim the mushrooms. Add mushrooms to the pan and some black pepper to taste. Continue cooking on a high heat until the liquid has reduced by half. 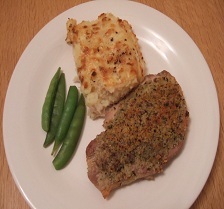 Remove chops from oven and place on serving plates with reduction spooned over them. Serve with mashed potatoes and seasonal vegetables. While the onions are cooking brown off the sausages in the frying pan and leave to cool. Cut the sausages into 1cm / ½ pieces and add to the pan. Add stock cubes, chilli powder, cumin, paprika, worcestershire sauce, soy sauce and mustard powder. Season well with black pepper and stir well to coat the sausages. Pour in tinned tomatoes, the remaining herbs and the tomato puree. Add baked beans and stir well. Allow to simmer for 30 minutes. Put the sausages on to grill, turning occasionally. Chop the onions and fry over a medium heat in olive oil, until soft (if you do this with a lid on there is less chance of burning). Cut the chorizo into small cubes and add to the pan. When the sausages are browned, cut them into 2.5cm / 1" lengths and add to pan. Cut the carrots in half lengthways then slice into half-moons and add to the pan. Add tinned tomatoes and stock. Drain and rinse kidney beans and chick peas and add to pan and stir well. Mix in herbs, paprika, and good amount of pepper, followed by the tomato puree. Stir for a few minutes and then reduce the heat. Put the lid back on, and allow to simmer for 45 - 60 minutes, stirring occasionally. Peel and halve the mushrooms and stir into stew. This dish will serve 4 people for 2 meals, so freeze rest or serve next day with dumplings for variety. Place the flour, salt and black pepper in the mixing bowl and make a well in the centre. Using the balloon whisk, mix to a paste, incorporating some of the flour from the edges. Gradually add the milk and water, whisking all the time. Leave to rest at room temperature. Grill the sausages until they are brown but not cooked all the way through. Preheat the oven to 220ºC/425ºF/Gas Mark 7. Place the oil in the roasting dish and heat in the oven until very hot. 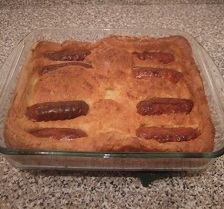 Add the sausages to the dish then pour the batter in. Bake in the oven for about 40 minutes or until the batter has risen and browned. 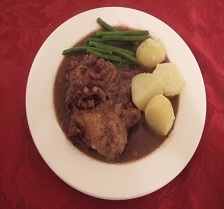 Serve with seasonal vegetables and gravy. Heat water in the large saucepan and add the pasta when it starts boiling. Finely dice the pancetta and and preheat the frying pan. When the spaghetti has been cooking for about five minutes start frying the pancetta on a medium-high heat. While these are cooking break the eggs into a bowl. Finely grate the Pecorini Romano cheese and add about 4/5 to the eggs. Add the cream and freshly ground black pepper to taste and whisk together using a fork. When the spaghetti is cooked drain and return immediately to the large saucepan (take the saucepan off the heat). Add the pancetta (which should be golden and crispy), including the fat. Using the two wooden spoons thoroughly mix together. Heat from the spaghetti will cook the egg, just make sure it doesn't curdle. Serve into 4 preheated bowls. Garnish with the remaining Pecorini Romano cheese. You can replace the cream with olive oil or butter for a more authentic Italian version of the dish. Finely slice onion and fry in a little olive oil until soft. Core, deseed and finely slice red pepper and add to onions. Finely chop and add garlic and fry for a few minutes. Lay chorizo slices in the flan base and pour onion mixture over the top. Sprinkle cheese over the onions. Beat eggs and yolks, add milk, oregano, paprika, and fresh black pepper. Finely dice the chorizo into small cubes and add to onions and garlic. Finely dice the tomatoes and add to the pan.